NEW YORK: There are an estimated 11.9 million illegal immigrants in the US constituting four percent of the population, according to a study released on Tuesday. The study by the independent Pew Research Center, which is based on the data collected by the US Census Bureau till March 2008, says their children, both unauthorized immigrants themselves and those born in the US, make up about 6.8 percent of the total enrolment in elementary and secondary schools. According to the study, more than 8.3 million of these illegal immigrants are languishing in low-paying jobs, accounting for 5.4 percent of the total labour force. 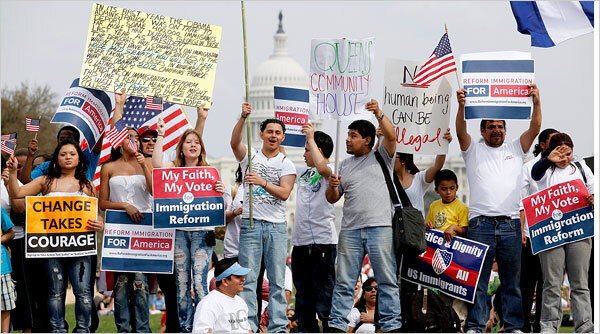 About 76 percent of all illegal immigrants are Hispanics, with Mexicans being the largest group at seven million. Nearly 11 percent of undocumented immigrants come from Asia and Central America each, 7 percent from South America, 4 percent from the Caribbean and less than 2 percent from the Arab world, the study says. With 2.7 million illegal immigrants, California has their largest population. Though the state's illegal population has almost doubled since 1990, its share of their total numbers has dropped from 42 percent to 22 percent. Unlike in the past, according to the study, illegal immigrants are now evenly spread across the US. Though California, Florida, Illinois, New Jersey, New York and Texas remain their favourite destinations, Georgia, North Carolina and other southeastern states too now attract them in large numbers, the study says. Since undocumented immigrants are exploited by employers, their median household income is $36,000, well below the $50,000 for US residents. As a result, one third of the children born in illegal immigrant families live in poverty, according to the study. Illegal immigration in the US has been a complicated problem for years now, with both the Democrats and the Republicans soft-pedaling the issue. Open borders with Mexico, lack of border patrols and cheap labour for US employers even though it is illegal to hire them are the major factors for the rising illegal immigration population in the US. Since President Ronald Reagan had granted one-time amnesty to about three million illegal immigrants in 1986, their population has unofficially risen to 20 million in hopes of getting legal status one day. Take the Green Card Lottery test to see if you qualify. If you do, apply for the DV2014 Green Card Lottery here on the Official USA Diversity Lottery web site.